Why would the “Socialist” in Chief plot to kill a pro-democratic opponent? 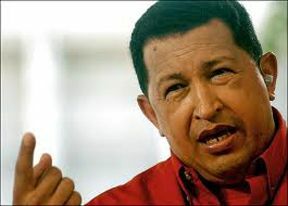 BREAKING NEWS: Venezuela President Hugo Chavez, Dead at Age 58. Hugo Chavez will not be down for breakfast. The socialist dictator of Venezuela has passed away from cancer. Make room Kim Jung Il, Hell has a new resident. After numerous claims that Chavez was recovering from cancer from his propaganda machine, Chavez succumbed to complication of cancer. His death leaves Venezuela bitterly divided. But isn’t that exactly what a dictator does while in power, divides the people so that they are too busy fighting each other and blaming eash other, than focusing on the real problem, the man in power. Doesn’t that sound familiar, but I digress. 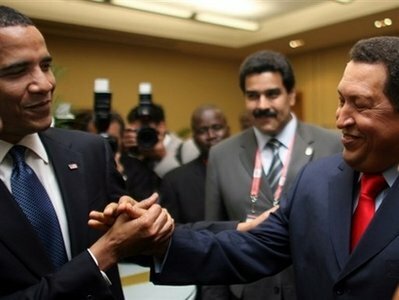 Chavez, a devoted enemy of the United States, was praised by his bud, former Democrat President of the United States Jimmy Carter. How misguided could one possibly be and a glimpse into what Democrat presidents believe in and call help to the people. Other Democrats like Rep. Jose E. Serrano (D-NY) released a statement praising former Venezuelan President Hugo Chavez; however, neglecting the crackdowns of his political opponents. A glimpse into the Democrat party indeed. According to accounts, elections will be held in 30 days, and Vice President Nicolas Maduro will assume the presidency in the interim. We came to know a man who expressed a vision to bring profound changes to his country to benefit especially those people who had felt neglected and marginalized,” Carter said in a statement. President Hugo Chavez was a former paratroop commander and self-styled “subversive” who waged continual battle for his socialist ideals. He bedeviled the United States and outsmarted his rivals time and again, while using Venezuela’s vast oil wealth to his political advantage. Chavez led one coup attempt, defeated another and was re-elected three times. Almost the only adversary it seemed he couldn’t beat was cancer. He died Tuesday in Caracas at age 58, two years after he was first diagnosed. UPDATE II: Hollywood whacko Sean Penn on Hugo Chavez’s Death: ‘I Lost a Friend’. Hmm, didn’t insanoid, former NBA bad boy and attention whore Dennis Rodman call the socialist dictator of North Korea Kim Jung Un a friend as well? Oh yeah, another enemy of the United States. Take a good look how people are treated by pro-Chavez folks who are perceived being apart of the opposition. A news media crew is attacked under the assumption they were working for the opposition media to Chavez. UPDATE III: More on the statements from former US President Jimmy Carter because this is really important for Americans to understand about a Democrat party that has so lost its way. How is it possible that we have such prominent Democrats coddling a man who oppressed his people? These are the same people that slam Conservatives, Republicans and the Tea Party … but praise the good of a dictator. As the Gateway Pundit opines, Carter wants you to remember the positive things that Chavez did. Hmm, didn’t Hitler make the trains run on time? Think about that America. Give that one a long good thought. Especially the next time you vote. Some doctors saying that Venezuelan President Hugo Chávez’s cancer is most likely terminal. What will a Venezuela without Chavez look like in the future? Venezuelan President Hugo Chávez’s cancer is most likely terminal given the disease’s recurrences, and while the president may bounce back for periods, his health is increasingly at risk, say several leading cancer specialists not involved in the treatment. Mr. Chávez is recovering from surgery in Cuba this week after the president said malignant cells reappeared for a third time in his abdomen. Venezuela’s government hasn’t disclosed what type of cancer he has or what the surgery was for. But it has described the more than six-hour operation as “complex and delicate” and said Mr. Chávez might not be back in Caracas in time for his Jan. 10 inauguration for a new term after 14 years in power. Ahead of his fourth cancer surgery in 18 months, Venezuelan President Hugo Chavez has named Vice President Nicolas Maduro his successor. The 50 year old Maduro is one of Chavez’s longest serving aides, having been the president of the National Assembly before becoming Foreign Minister in 2006. Venezuelan President Hugo Chavez named a longtime ally with close ties to Cuba his heir apparent as the cancer-stricken leader prepares for a potential departure after almost 14 years in power. Chavez, in a nationwide address over the weekend, said he was throwing his “irrevocable, absolute” support behind Vice President Nicolas Maduro to lead his 21st century socialist revolution should he be unable to carry out his duties. Chavez made the comments as he prepared to fly to Cuba for surgery, his fourth in 18 months, to treat an undisclosed form of cancer that he said reappeared in exams after winning re-election Oct. 7.